This information is provided courtesty of Washing Metropolitan Transit Authority. All rights reserved. to download a color version of system map in Adobe ".pdf" format suitable for printing then click here and your browser should download the .pdf automatically. Note this map is designed for printing, and so as a result it may not look perfect on the computer screen. Transfer Stations are indicated by the dual concentric circle. These permit the traveler to transfer from one line to another. 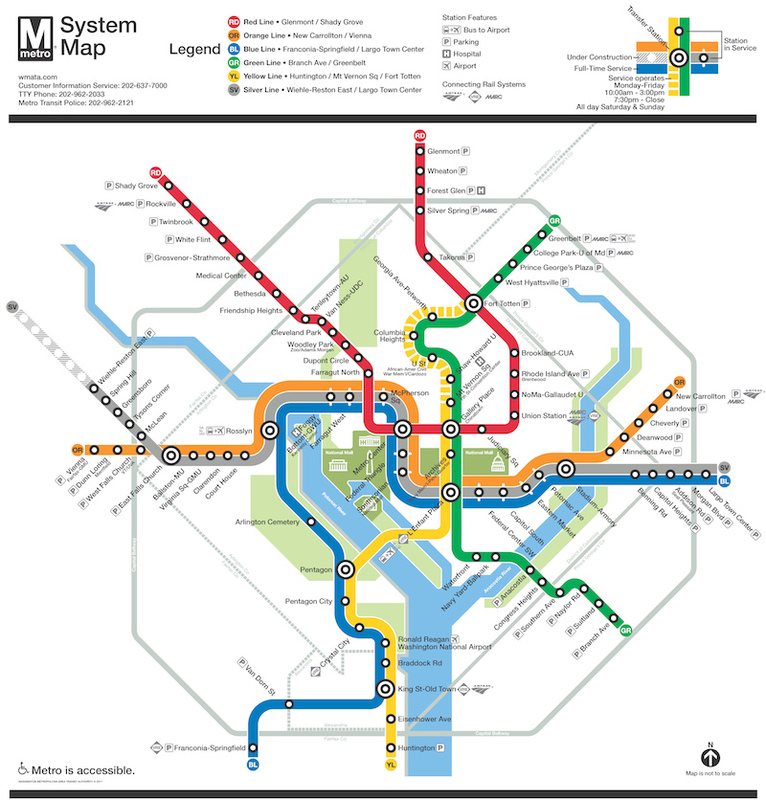 For example "Metro Center" is a Transfer Station for the Orange, Blue, Red, and Silver lines. The Metro line travel direction is not stated in terms of East or West, etc. The heading of the train is indicated by the name of the end of the line station. So as an example, when traveling to visit Company Seven from National Airport: proceed on the Yellow line to Gallery Place, then transfer to the Green line heading to Greenbelt. The Silver line runs from Largo in Maryland, through Washington, D.C. then out to Reston, Virginia where from there one can ride the shuttle bus to Washington-Dulles International Airport (IAD). Below is a map of the system as of 2017. To see the enlarged view as a .jpg higher resolution (2,946,513 bytes) file click on the map below and the larger imager will pop-up.